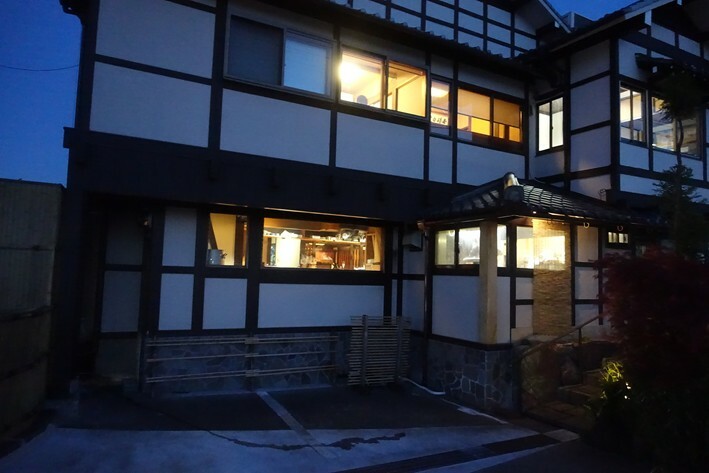 Tempura Matsu is located on the outskirts of Kyoto, around half an hour by taxi from the centre of the city. 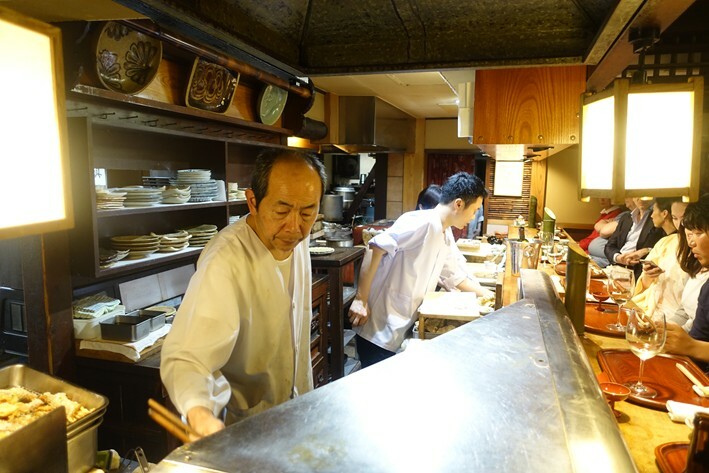 Opened by owner Sunichi Matsuno as a family restaurant, his son Toshio Matsuno is now in charge. The latter has gathered experience working with Alain Ducasse and Grant Achatz, as well as learning his trade with his father. The restaurant opened as a tempura shop but now serves kaiseki kappo with tempura as just part of the meal. 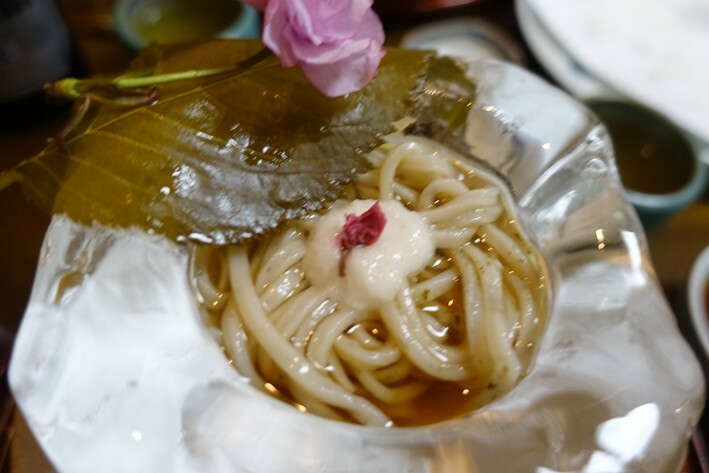 It uses premium ingredients like Tsuiyama snow crab, line caught tuna from Aomori, lobster from the Seto inland sea and Lake Biwa wild eel. 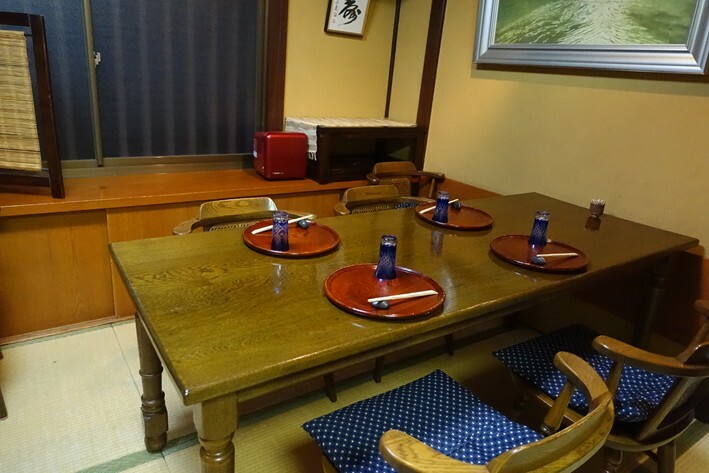 There is a counter around which the seats are arranged, as well as a separate room at the back that can act as an overflow or for private dining. This was fortunate as somehow they had lost my reservation, which is a first occurrence for me in my many trips to Japan. This may conceivably be connected to their reservation book bearing a striking resemblance to a Rorscharch test (doubtless it makes perfect sense to them), but luckily they accommodated us in the room at the back. 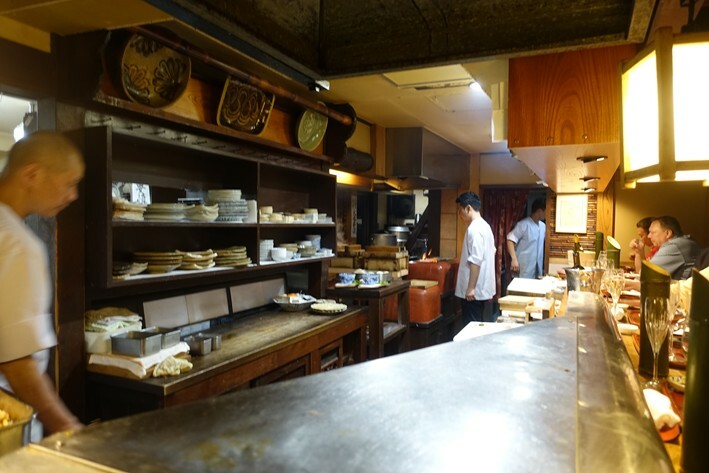 There were two alternative menus offered, at ¥10,000 (£62) and ¥14,000 (£87) - we opted for the lengthier one. 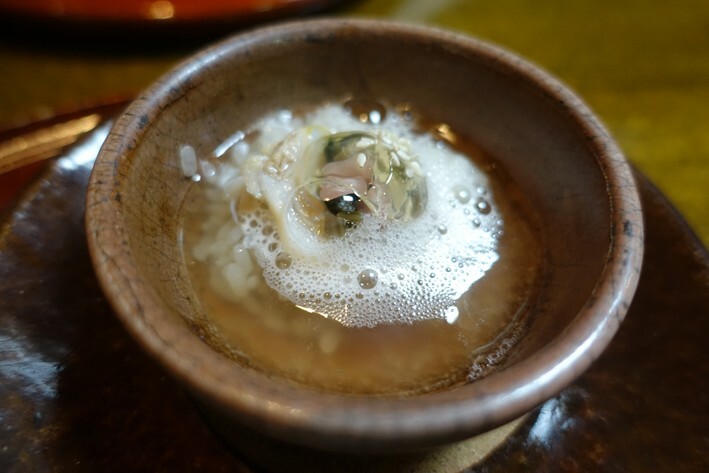 A single clam with rice and Japanese greens was covered in a dashi jelly that was melted by pouring broth over the jelly. I confess that I am not a fan of clams, which are so often chewy, but the version here was surprisingly tender, and certainly this was an innovative way of serving it (16/20), This was followed by impressive tempura of oyster, the batter very light indeed and the oyster excellent (18/20). 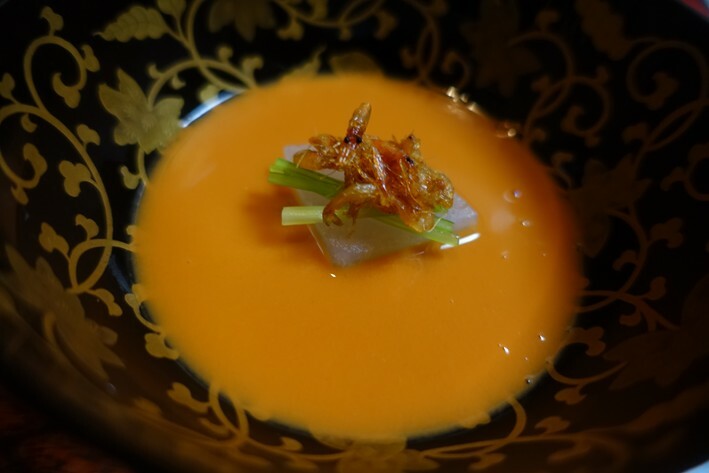 Sakura shrimp on a little bed of rice was served with radish and a prawn soup poured over it at the table, served in a pretty bowl that was apparently two centuries years old. The prawn had lovely sweetness and the soup had deep seafood flavour (17/20). Two nested wooden boxes each contained a fish dish, each served cold. The top one was bonito with ginger and soy and the bottom one had sea bream sashimi with chives and ginger. The sea bream was particularly impressive, as even at top sushi restaurants this can be chewy, but here it was fine and had lovely flavour (18/20). Next was octopus served warm and served in a little broth. I find octopus to be a very challenging ingredient, requiring considerable skill from the chef to render it tender enough to eat. Even in Japan I have all too often ended up gnawing through rubbery octopus. The version here was a revelation - beautifully tender with great flavour, actually the best I have eaten anywhere. 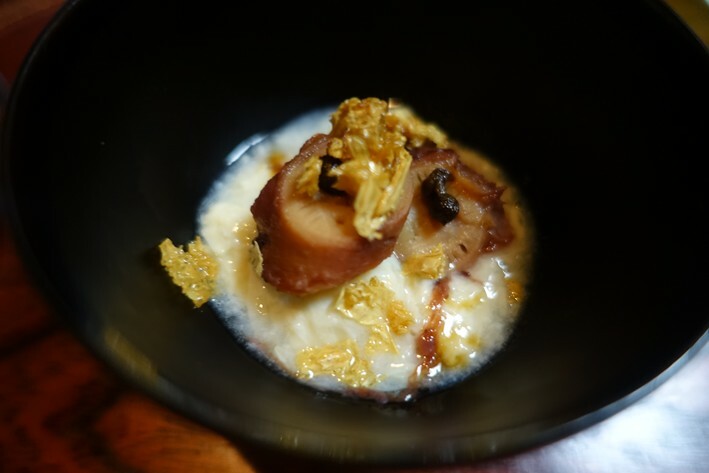 It is one thing to take an ingredient like a beautiful scallop or langoustine and make it taste good, but anyone that can make octopus taste like this has my undying admiration (19/20). 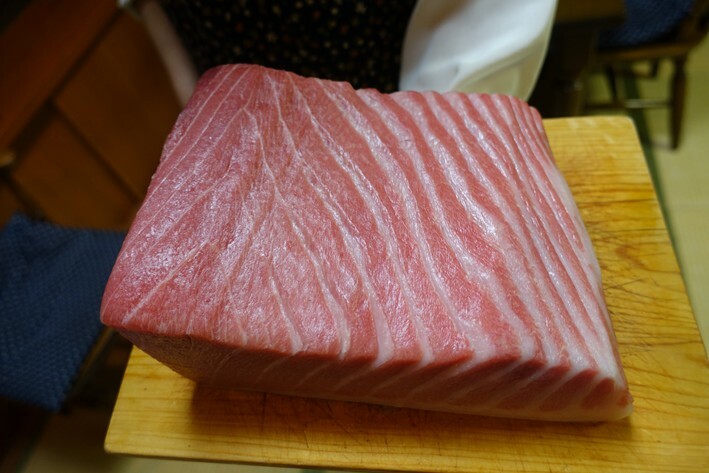 Next was fatty tuna (otoro) served with steamed rice and sesame sauce, nori (seaweed) and with fresh wasabi grated at the table by one of the chefs. On the side was crab and rice with tofu and onion, all of which was very enjoyable, just letting the fine ingredients speak for themselves (17/20). 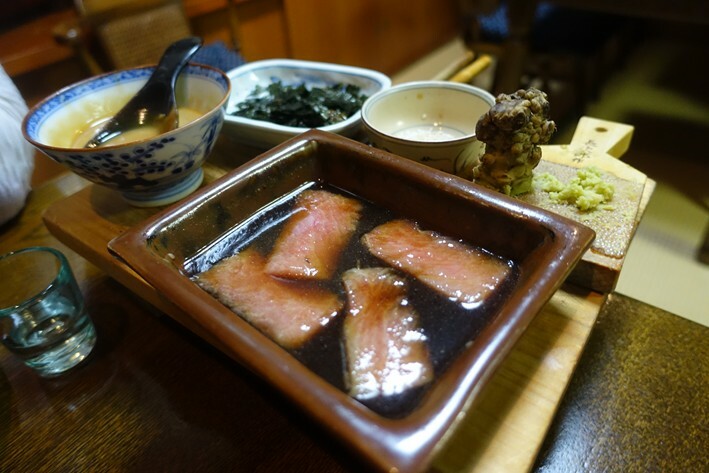 Omi beef came with radish, mountain vegetables and sansho flower, which gave a gentle peppery bite to the dish (17/20). 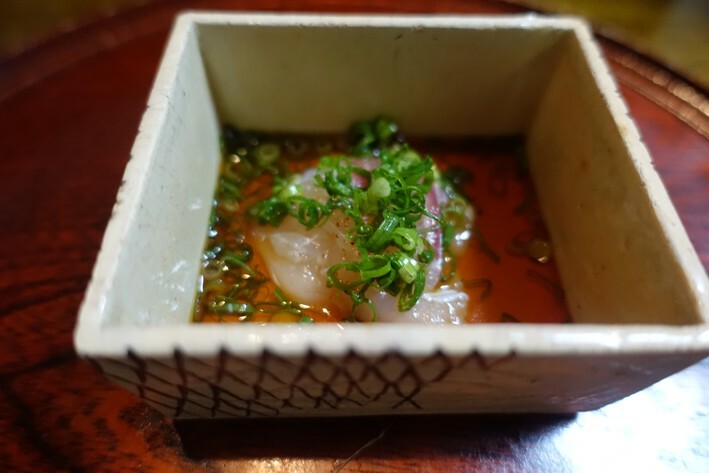 At this point we also tried red snapper in a spicy sweet, deeply flavoured broth that had remarkable and intense flavour, and one that I will remember for a long time (19/20). Next was tempura of sweet potato and also of a flat fish that the waitress did not think had an English translation but may have been whiting. After this came tempura of prawn and lotus root. As before, the tempura batter was feather light and the ingredients impeccable, with a lovely sweet prawn and terrific lotus root (18/20). Finally in place of the customary rice and pickles there were home made cold udon noodles served in a carved out block of ice. 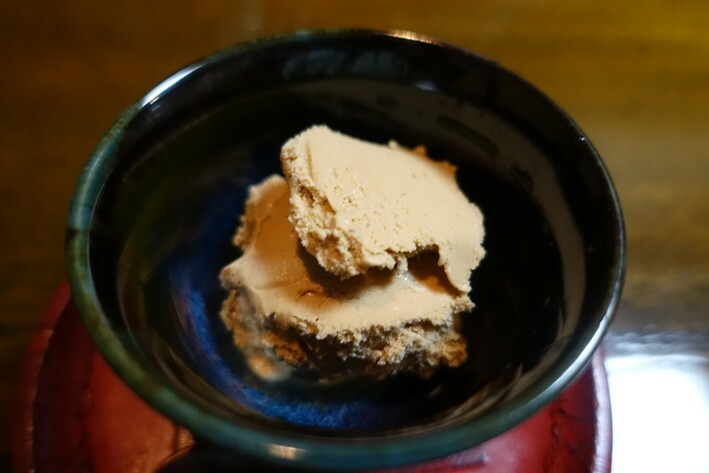 Japanese tea ice cream concluded the meal. The bill came to ¥32,184 for two with beer to drink which works out at £110 per head, it is important to note that they do not accept credit cards of any kind here, just folding Japanese yen. This was an impressive meal, a modern take on kaiseki dining that is not afraid to break with tradition yet still respecting it. It happened to feature a number of ingredients that I would not have chosen and yet the kitchen managed to treat these with great skill. I am always impressed by a chef that can make me enjoy ingredients that I normally dislike. Michelin have shunned this restaurant but I liked it more than some of the grand three star places in the city. I ate here a few weeks ago, my first visit to Kyoto and I ate many memorable things but my meal at Tempura Matsu was on another level. 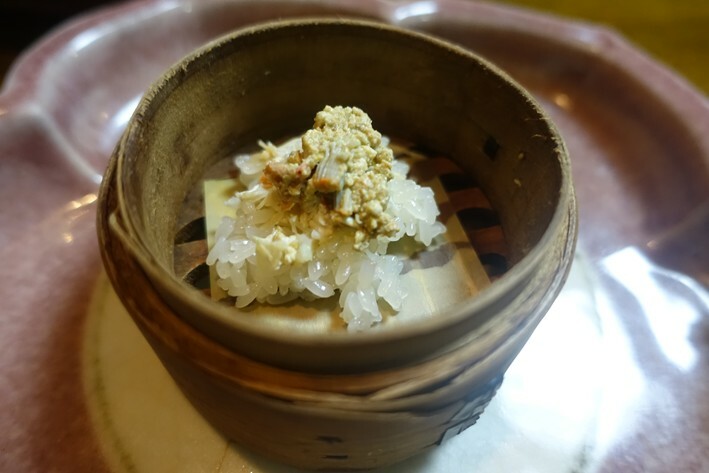 Our last savory course aside from the tempura was a stew of yuba with scallop served in a chunky eathenware vessel on a pile of rock salt, and topped with a great handful of sea urchin. It was one of the very best things I have ever eaten. Hi. We enjoyed your review very much. We made reservation for dinner there for the end of March and after reading your description of the courses it is hard to wait... We will be happy if you could recommend a good restaurant in Tokyo. Maybe one with goog sashimi. Many thanks. Ronit & Amir.